Gorgeous, secluded lodge nestled in a meadow with end of road privacy and creek frontage - 3 bedrooms plus loft, 2 1/2 baths, airy and spacey!! Yet plenty of room for re-kindling of families and romantic evenings. Our 2400-square-foot lodge is very comfortable and homey. There are high cathedral ceilings, hardwood floors and a very comfortable covered large porch for lounging, relaxing and listening to the creek. The main floor includes the living room, dining area, kitchen and master bedroom in main floor which has a very private jacuzzi tub for your enjoyment, a full bath and king sized bed. 3 steps up on the hallway and there are two additional bedrooms one with a queen bed and the other with two twins.There is also a bath and a half next to the two bedrooms.And of course there is the loft, which holds one twin sized bed and a full size futon. Most importantly, you won't need a 4WD vehicle to get to us!!!!!! Quiet and end of road privacy is a forte on this property. Pet policy:: Sorry, Dogs allowed only!! No cats or other animals. ALL pets must be pre-registered with owner !! Fee: 1 dog $30, 2 dogs $45 will be applied to cleaning fee. All pets must be at trained stages!! Blue Ridge Activities: Blue Ridge contains many unique art galleries, antique shops,specialty shops, neighboring apple orchard and eateries, Vogel State Park just 20 min. away, leisurely shopping and dining any time of the year. Don't miss the free summertime seasonal Blue Grass concerts and gatherings by the Toccoa River. And don't miss the Fanning County Park and Recreational Complex just in back of the hill by our property (it's great to ride bikes in, running, basketball or a wonderful workout from our place. After all that exercise you deserve a break for coffee and fresh fried apple pie from Mercier's Apple Orchard or enjoy cool ice cream or hot chocolate. Also,in the center of town is the old railroad depot which is listed on the National Registry of Historical Places. At Lake Blue Ridge you can rent a pontoon or boat,or just enjoy the view of the surrounding mountains. County is renowned for fly fishing. The waters of the Ocoee River, in Polk County Tennessee,offers exceptional kayaking and white water rafting. Oh, let me just mention that Blueridge has a drive-in movie theater 'The Swan' but just in case it rains there is a regular cinema. Also, if you like drag racing check the racetrack by Sugarcreek out (across from Hwy.5). Beautiful gas logged. Keeps everything clean. Nice and comfortable furniture and very spacious. Both sofas have dual recliners. Surrounded by windows allowing the outside in. Fully supplied kitchen. Nice porch with Weber charcoal grill and Bistro set for 2 right next to kitchen and overlooking the creek. Wonderful gathering spot with full view to the outside and fully surrounded by windows. Nice and spacious! Outside front porch dining available as well. Covered Wrap around porch with rocking chairs, bench swing, and two bistro sets facing the creek plus a Weber grill. There is a picnic table down by the creek with a real rock fire pit. Nature trails on property for pleasure walks. If you wish you may pan for gold at our creek or catch some craw-daddies but please release. Come watch wildlife drink from our creek or enjoy bird watching. Large television unit connected to satellite dish and an additional television set with electronic games and childrens' movies on the loft. Large natural stone gas fireplace with remote. Relaxing oasis in the mountains. We loved getting away from it all for Christmas this year in this quirky home. It is truly one with nature-with floor to ceiling windows and doors on the main floor-allowing for beautiful views of the creek and surrounding trees. The shape of the house gives it a lot of character-lending a feeling of being in a fairy tale house in a forest. We napped several afternoons to the sounds of the creek babbling. The reclining sofas are incredibly comfortable! The only thing the home was missing for us-a group of avid readers-was lamps in the living room. We were able to quickly remedy the problem with a quick trip to the Walmart to buy a floor lamp. Secluded yet convenient. Has everything you need. Close to Blue Ridge. Honey for the Bears is a lovely home. The deck overlooking the creek was our favorite spot. 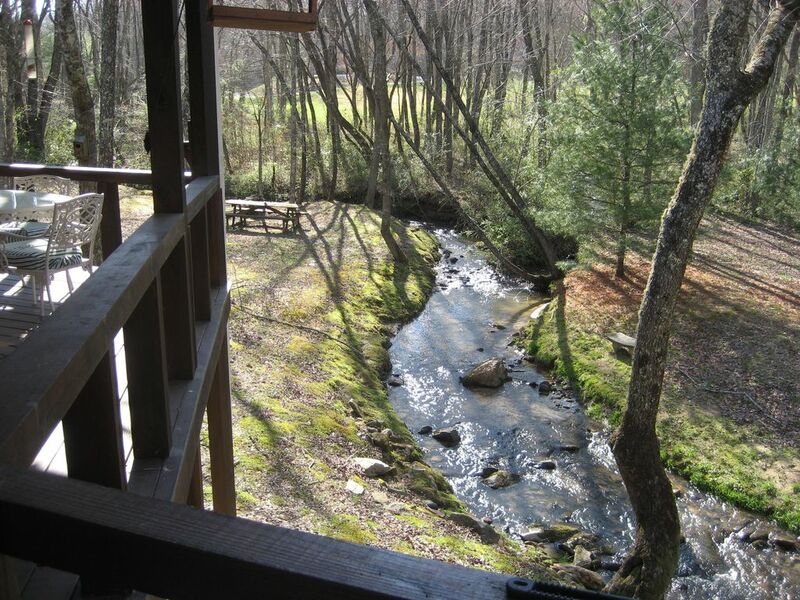 The view from the master bedroom overlooks the creek and woods, and, with the slider door open, the sounds of the creek and the cool breeze make for an excellent, soothing sleeping spot. The home has all the amenities of home with shopping just a very few miles up the road. The isolation was exactly what we were hoping for. Maria is a wonderful hostess who answered all our questions. We're looking forward to our next stay there. My family and I enjoyed our stay at this property. It worked out perfectly for us. It is private in that you don't see anyone around you which gives me and my wife the needed respite. We all enjoyed, including the girls, playing in the delightful stream merely steps away from the house period a highlight of our trip was everyone creating their own little boat and having boat races down the stream. Inside the home was very nice as well and it was fairly good from a Wi-Fi standpoint as well. I have Sprint so I was not able to get coverage other than Wi-Fi calling. The property was also a little hard to find upon arrival as it was pitch black dark and pouring rain. While it was frustrating at the moment, it added to the memories of the trip. :-) the hosts were available and helpful and I anticipate we will be asking to stay again in the future. This is a great property for families with children and would also be idealistic for a couple retreat for my wife and I. This house is not for the very old or handicapped. Stairs lead down to the house and the bank to the creek is sloped. It is an older house I'd say 30 to 35 years old. It is definitely not the cleanest house we've ever rented, but livable. There is plenty of room with three bedrooms and a loft. There was only 4 adults and two small children in our party so we had plenty of space. I was not pleased with the curtain over the master bathroom entrance instead of a door. The porch was great! Listening to the creek was a pleasure. The small town of Blue Ridge was nice and we enjoyed the train ride. Good day, Upon my review of the vacation site I re-read the comments for the review. Yes, this is not a "new" house as it was built in 1989 however, it is a very comfortable country home which brings much joy to many. it is located in a wonderful and friendly terraine, not steep. There are no steep staircases but rather a spiral staircase for young ones to access the loft. There is a side entrance for those with less mobility like the elderly, however 4 steps are required for entry to main living area. As per the cleanliness I wish you would have called me directly to speak with the property management team and could have been resolved as the owner is at the mercy of the staff that cares and manages the property for a fee and it is expected that the property is turned over clean, regrets for any inconvenience! Lastly, correction is needed-the Master bedroom is very private and it has a door at the entry. However, points are taken as opportunity for improvement and any deffiencies on our part that can be corrected will be corrected. The management team will be sent a copy of your review. We are ideally located in the beautiful North Georgia Blue ridge mountains, just south of the Tennessee and North Carolina borders and only 1.5 miles off the highway! Near by towns include: Downtown Blue Ridge (5 min. ), Blairsville (15min), Atlanta Aquariumand Stone Mountain (1.5 hour), Ellijay (15min), Helen (30 min),Young Harris (15min), Murphy(15min), Chattanooga, TN Incline Railroad, Ruby Falls(40 min. ), Ashville, NC (2.5 hrs. ), Gatlinburg, Cherokee or Bryson City (1-1.5hours). Drive to the nearby Toccoa river or to the Ocoee or Nantahala rivers for: Kayaking, Canoeing. Oh,if you like wine please save some time to visit some of the nearby wineries (great treat). Other Activities: Boating, Kayaking, bird watching, drive in movies, apple orchards and vineyards, race track. Property information package will be sent by owner approximately one week prior to stay. Property Address : 428 Meadow Creek Way, Blue Ridge, GA 30513 **Pets must be registered. Maximum of 2 pets (DOGS only).